Our project proposal FRESHRAP, Feasibility study for an innovative “Regenerative Atmosphere Packaging” for fresh chicken (710464) has received the “Seal of Excellence” by the European Commission. This quality label is awarded to project proposals submitted for funding under Horizon 2020, which succeeded in passing all of the stringent selection and award criteria but could not be funded under the available Call budget. The ‘Seal’ identifies project proposals which merit funding from alternative sources public or private, national, regional, European or international. Following evaluation by an international panel of independent experts, FRESHRAP project WAS SUCCESSFUL IN A HIGHLY COMPETITIVE EVALUATION PROCESS AS AN INNOVATIVE PROJECT PROPOSAL. 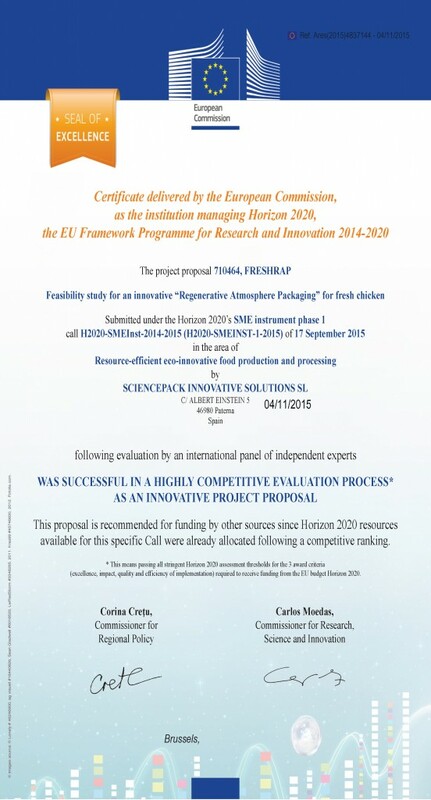 Our project passed all stringent Horizon 2020 assessment thresholds for the 3 award criteria (excellence, impact, quality and efficiency of implementation) required to receive funding from the EU budget Horizon 2020. The ‘Seal of Excellence’ supposes a holder certificate of the European Commission to approach alternative funding sources (regional, national, private or public) and present the certificate as a label of a high-quality project proposal. Thanks to the ‘Seal’, high quality proposals from innovative Small and Medium Enterprises have additional chances to be funded.